We will review our lesson on coin story problems and be ready to take a quiz on Thursday. We will continue working on D=RT story problems. We will continue working on volume of 3D shapes, and take a quiz on Thursday. We will continue working on Vectors and Addition of Vectors. We will continue working on graphing hyperbolas. Upon our return from Spring Break, we will be working on a Performance-Based Learning Project that will involve interviewing skills. Therefore, we will be watching various interviews and discussing techniques, types of questions asked, what did the interviewer do, or not do, to make the interviewee more comfortable. We will also be reviewing topic sentence development for their Written Expression skills. We will be working on graphing inequalities. We will be working on radicals, basic operations and simplifying. We will be working on finding slope in slope-intercept form. We will continue our exercises with fractions, percentages, and the use of circle graphs to display information. We will continue work on our job application folders including business cards and positive experience stories to use during interviews. We will consider the research methods of Tommy Gregory Thompson, an engineer who specialized in underwater salvage. Before he set his mind to find The SS Central America no one in the world had assembled the technology needed to salvage a gold ship several miles below the surface of the ocean. Today students presented their posters on the oceans. Next week we will finish Chapter 23 and will be taking a test. We are working on mixed problems in converting to/from particles to moles. Mass to/from moles, and volume to/from moles. The end of next week we will finish our practice and take a test on these conversions. We will begin our unit on physical activity and how it helps your body. The students will also set goals and work toward achieving them by exercising at the YMCA. This week we are finishing up our Script Writer, Composer, Costume Designer, Set Designer Project with Presentations. Next week we will learn about the nuts and bolts of DANCE, with some opportunities for improvisation. There will be a Quiz on Thursday. This week the students shared some of the visuals they plan on using during their TED Talks in May. They discussed the images and how they related or would tie into their overall message. Each class did a wonderful job engaging as a ‘club’ and provided positive and productive feedback. Next week we will begin looking at how to construct a memorable conclusion with focus on what they want the audience to think or do after hearing their individual messages. We will be finishing our unit over systems of equations and taking a quiz this week. We will be continuing to work on story problems with ratios. We will be finishing up our unit on circles and taking a quiz this week. We will be continuing our work with converting between polar and rectangular equations. We will be finishing our lesson over graphing parabolas and taking a quiz this week. We are finishing up our lesson on converting slope-intercept form into standard form, and vice versa. We are also learning to identify parallel and perpendicular lines from the slope-intercept equation. Next week, we will work on review and have a test. We had a test on parts of the circle, central and inscribed angles, length of an arc and area of a sector. Next week we will be finishing up the unit on circles. We took a test on single, double and multi-step equations and solving for the unknown. We will begin a lesson on the Distributive Property. We are working on wrapping up our newspaper articles, as well as continuing to read The Book Thief. We are finishing Tuesdays with Morrie and practicing being more thorough in our responses to comprehension questions. We are working our way through chapter 2 and will be preparing for the chapter quiz. We are practicing drafting in order to improve our drawing skills. The students have completed viewing the movie’ “Anne Frank: Diary of a Young Girl.” There extra reading of a Holocaust-themed book was due yesterday. We have begun the planning process for writing an article about the Holocaust which will include direct information from both sources. This past week students created costumes and a set design for their play! They are creating a design using a bird’s eye view as well as from the audience’s perspective. Next week they will begin learning the elements of music and creating an original song! Earth Science students just took a test on Chapter 30 (stars and other objects in the universe) and have begun watching Interstellar, a movie that looks at black holes, exoplanets, wormholes and space travel. We are discussion the chapter topics and ideas as we watch the movie. Next week we will begin studying the oceans. Chemistry just took a test on naming ionic and covalent compounds. We will be adding on the concept of naming acids and bases, and the pH table next week. We will be looking at basic Tax Forms in hard copy and online. We will continue to research and brainstorm ideas for how to improve Mr. Veazie’s Projection Screen System. We will be looking at job hunting resources and discuss what our class has already experienced in the way of job hunting. This week the students began outlining their Ted Talks. Many of the students drew pictures to help them connect to their overall message. Next week we begin Exploration 4. This is when they will really start filling out their ideas and begin sharing these plans as a group. We will be continuing with systems of equations and start the third method, solve by elimination. We have a quiz Monday over Application with Percent problems, and we will begin our new set of story problems using ratios. We will continue working on Inscribed angles and begin the circle pizza project. We have just started a new lesson on Polar equations. We will continue working on graphing parabolas. We will finish an excerpt from Malcolm Gladwell’s book, Outliers, concerning the impact of learning differences in the lives of several successful entrepreneurs and professionals. On Tuesday we will have a guest speaker, Mr. Veazie, who will discuss a project involving his innovative design for large portable video screens. Our class has started using Reflex Math, a program that teaches and reinforces math facts. We will be working on identifying our personal success stories, sharing them, and writing them out. We will discuss the importance of building on successes and using Asset Based Thinking. The beginning of our swim exercise program is on Tuesdays and Thursdays!! The students are also continuing to gain strength and flexibility using the YMCA’s exercise equipment. They will have to pass a fitness test in the spring. We will continue our presentations on Cultural Diffusion and also move on to population growth. We are wrapping up the Civil War, expect the exam towards the end of the week! We have finished Chapter 30, will review on Monday and Tuesday, and take the chapter test on Wednesday. Students should be studying their notes daily. After the test, we will watch the movie Interstellar. We have finished naming ionic and covalent compounds, will review on Monday, and will have a test on Tuesday. Then we will work on naming acids and bases. This week everyone presented their ‘big ideas’ or what they plan discuss in their TED TALK. The students not only shared their ideas, but they practiced providing specific positive and constructive feedback. It was wonderful to watch them all put so much effort into providing helpful feedback for each other. Team collaboration in action!! Next week we will review the information shared and begin outlining their talks. Well, by now you must know that the winter weather last Tuesday messed up our IRT plans. Since they are unable to accommodate us for a future show, we are watching the 1959 black and white movie version of “Anne Frank: The Diary of a Young Girl” with the lovely Millie Perkins. We are eating popcorn and drinking Stevia-flavored soda. The students seem to be enjoying it. They need to have their additional Holocaust-based book finished reading by Wednesday, 2/27 (which is an extension). We will begin our writing project at that time. Unfortunately we were not able to see “The Diary of Anne Frank” last week! I’ll be looking for another show to see before the school year is over. We are in the midst of a Creative Project in which we are writing a script, designing costumes, set, creating music and choreography, in order to understand the ELEMENTS of each art form. 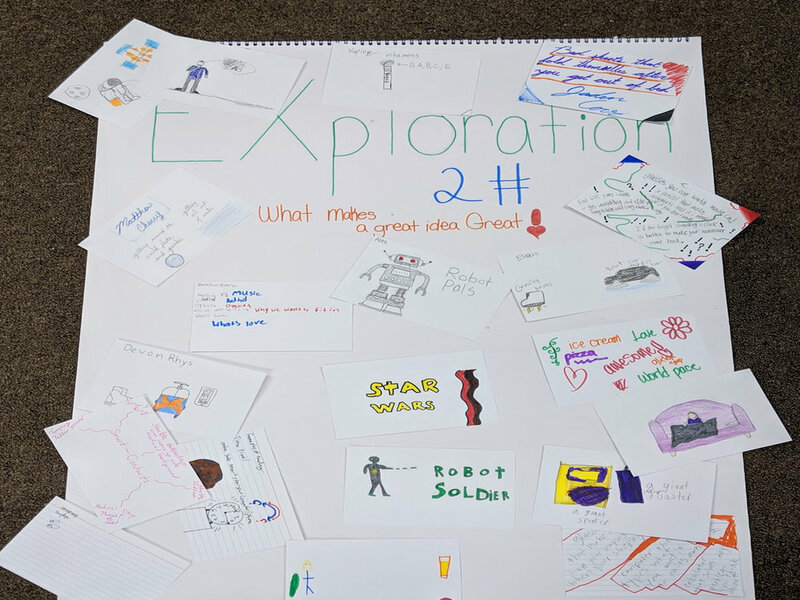 This week the Speech and Communication classes examined the question, “What makes a great idea….GREAT?” They each took some time to write/draw/share ideas they have or problems they would like to solve! A fantastic week! Next week the students will begin selecting their individual topics for the TED talks they will present at the end of the year. Time to get down to business. We are continuing to work on systems of equations and are in the substitution method to solve. We are reviewing application with percent story problems and preparing for a quiz over these. We are continuing our unit on circles and will be focusing on central angles and inscribed angles with intercepted arcs. We are finishing our unit over rectangular and polar coordinates and getting ready for a quiz. We just took a quiz over circles and ellipses and will start our lesson on parabolas. We just finished learning about the History of the American Musical. Today we took a tour of Theater at the Fort and set up the date for our May Show! (Friday, May 10 at 7:00 PM) Next week we will go to see “The Diary of Anne Frank” at IRT. We also started a script writing project based on a modernized Aesop Fable. We are studying stars and how they work. Next week we will be looking at the life cycle of stars, and the rule they play in the universe. Thursday we got into a discussion about flying stars and looked as several videos of different models. We talked about the new rules and laws that might need to be made if we have many flying cars running around our skies! In Chemistry, we are learning how to name and write formulas for different types of compounds. We are currently working on ionic and covalent compounds and next week will add acids. In Algebra 1, we are graphing lines with the y-intercept and discovering slope. We are also using the slope intercept formula. In Geometry class, we are working on inscribed angles and the corresponding arcs of a circle. In Paced Algebra class we are moving on from 2-step equations to multi-step equations. In English class we have been watching the film of The Diary of Anne Frank in preparation of field trip to the IRT next week. We are studying the concept of diffusion by looking at various religions and how they have spread throughout the world. This will culminate in an oral presentation to the class. We are wrapping up the Civil War and will be focusing on the assassination on President Lincoln and the unintended consequences of that. We are continuing with the reading of “Anne Frank,” and we are looking forward to attending the “Anne Frank: Diary of a Young Girl” play at the IRT on Wednesday. Afterward, we will be going to the Circle City Mall food court for lunch. The students have chosen another book from the Holocaust genre that they are to be reading/listening to on their own. They are to be done by Monday, February 25th. At that time, we will be writing an “article” about the Holocaust combining information from those three sources. We will finish our study of The Social Network (FaceBook) next week and then revisit Elon Musk (Tesla, Space X, Sun City) and fellow dyslexic entrepreneur Richard Branson of Virgin Airways. We will be designing mystery stories based on detetives using time lapse equations to solve crimes. We will resume our study of Change The Way You See Everything; required reading for every Google employee! When I was a math student, I learned that when you squared a number, you multiplied the number twice. And I learned that when you cubed a number, you multiplied a number three times. Not until I became a teacher and began working with hands-on materials did I learn that a number squared actually makes a square! And a number cubed actually makes a cube! 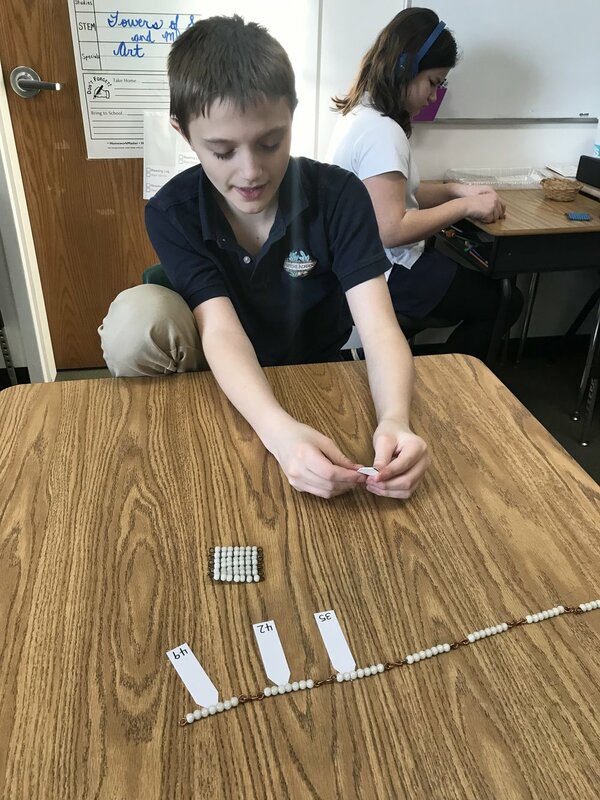 In math, we have been using bead chains to build both squares and cubes. This gives us a concrete, multisensory understanding of squares and cubes. It also gives us great practice in repeated multiplication and skip counting. In 2nd through 4th grade, we are not just learning about simple machines, we are practicing fine motor skills, spatial awareness, planning, problem solving, perseverance, and working together. We started with an introduction to the different types of simple machines, then began exploring and engineering with each. This week, we built gear sequences, and students designed/began designing structures with wheels. They learned that scientists and inventors usually have to spend a lot of time fixing problems and trying new things before their products work. They've been working together to come up with ideas and solve problems. The 2nd-4th grade students have been studying Native Americans. In art class, they made a replica of the Lenape Indian Village. Last week, the 7th and 8th grade traveled to Ft. Wayne to Science Central. They spent the day exploring hands-on science activities that highlighted some of the concepts and ideas they had studied previously this semester. That included the science of sound waves and energy. But they also focused on bacteria, viruses, diseases and how they spread…you know, typical science stuff to get you in the holiday spirit. The kids had a blast and we’d like to share a few photos from the trip. Last week our students once again stepped on stage to deliver their performance of a Fortune Academy original telling of A Sword in the Stone. Their debut performance sold out twice and the house was packed! I think it says something Performing Arts teacher and Director, Julie Pappas, was humbled by the students’ performance. “The cast of Sword in the Stone was committed from day one to giving their personal best through strong vocal projection and articulation, expression and characterization.” The students took everything they had been learning in class and in rehearsal to bring it all together in another Fortune-fashioned tale of triumph. Mrs. Pappas, alongside Assistant Directors Saman Murad and Ken Palmer, had been coaching them over the past few months in after school rehearsals. She proudly shared, “they overcame fear and anxiety and came alive on the stage with great poise and presence!” It’s always a marvel to see our students come alive in ways that we seldom get to experience in the classroom. And perhaps that’s part of what makes these musicals so incredible. Julie and her team have an uncanny ability to draw out our students’ strengths! For those in attendance, these were patently on display. We would also like to thank our parent volunteers who selflessly added such magic to the production. From hair, makeup, costumes, helping keep our students organized, and so much more. We couldn’t thank you enough! Below are some of the pictures we’ve received from the night. We’ll be updating this section as more photos continue to come in.